When the October issue of Midlands Business Insider arrived on my desk, I was intrigued by their recent feature about the top 100 manufacturing companies in the Midlands, and pleased to read how well the manufacturing industry is performing in our region. Business Insider have used turnover as a metric, so the top ranking companies include some very big global names, Jaguar Land Rover topping the list with a whopping £15.8bn turnover. Other notable top 10 companies include JCB, IMI, Toyota, Molson Coors Brewing, Alstom and Rolls-Royce. Whilst being excellent news for the economy in the Midlands, it also got me thinking whether there were any best marketing practices that other manufacturing companies could learn from these big hitters. Having taken a look through Business Insider’s very well complied list, a couple of companies stood out for demonstrating some effective digital marketing techniques across their websites. Warwick based boiler manufacturer, Baxi have a well designed corporate website, featuring clear navigation and interactive elements to guide visitors through the complexities of boiler solutions. This is backed up by clear calls-to-action for contacting local dealers, creating a clear journey through the site for visitors. 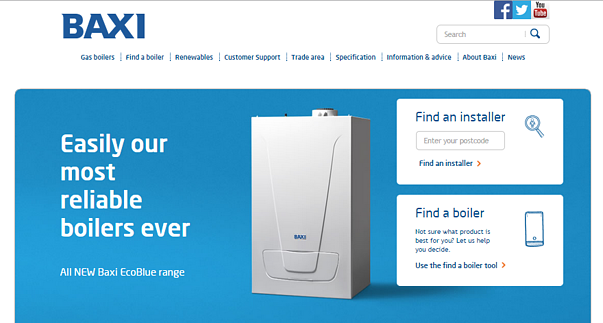 Baxi have considered their target audiences when developing their site content. The site caters for both end users and traders, so Baxi have created areas of their site specifically for each audience, backed up with clear navigation, relevant content and calls-to-action for each buyer persona. To clarify, a buyer persona is a semi-fictional representation of your ideal customer. By researching these personas and identifying their problems, needs, challenges and goals, companies can engage better with their prospects and develop content and offers which appeal to them, just as Baxi have done. Learn more about buyer personas here. Baxi engage with their end user and trade audiences well via social media. They use Twitter effectively to promote events, TV appearances and sponsorship. 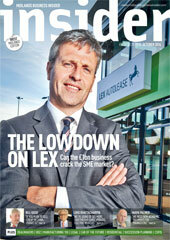 From a trade point of view, Baxi run live interactive Q&As with a well-known industry magazine, Installer Magazine. This is a great approach to encourage user engagement and a good PR opportunity to increase exposure in their industry. Baxi also run competitions, share company news such as charity events, and promote local Warwick news, giving them a personable company image which would appeal to end users. Baxi also use Youtube really well, sharing regularly updated ‘how to videos’ to solve common end user challenges, demonstrating that they have researched their buyer personas well. Baxi use a blog and an advice section on their website to provide helpful guidance for consumers on issues such as energy efficiency, grants and keeping warm in winter. Blogging is a great tool for manufacturing companies to share advice based content which resonates well with buyer personas. Creating content which responds to your audience’s needs, challenges or goals helps build trust, positioning your company as an industry expert who prospects will be likely to come back to when choosing their solution. Baxi do this by selecting timely issues such as preparing for winter and share advice such as how to reduce heating bills. Whilst Baxi use blogging for building B2C relationships, this approach is equally if not more relevant B2B companies, so don’t be put off if you’re a solely B2B manufacturing company. Another good marketing example to look at is Caterpillar UK, ranked 11th on Business Insider’s top 100 with a turnover of over £1bn. Caterpillar UK are based in Desford near Leicester. 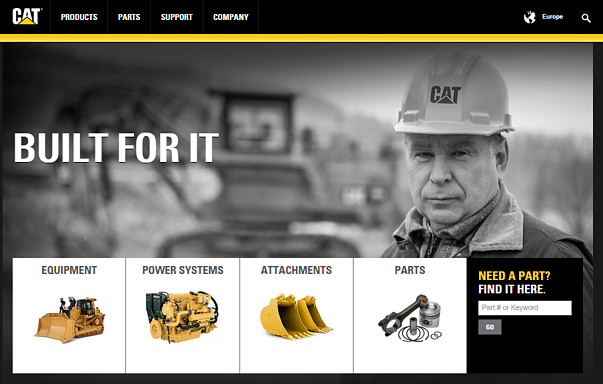 As such a large company, Caterpillar use a corporate site to link off to their main brands, each of which have their own website. The main CAT brand is represented well on corporate site and is easy to navigate to. The CAT site itself features a good design with clear navigation, making it straightforward for visitors to navigate to the appropriate product category. Caterpillar have also considered their buyer personas here, providing different site areas for equipment, power systems, attachments and parts. Each category covers the full product range, including detailed buyers guides, product specs and product comparison details. Caterpillar use calls-to-action such as ‘Find your local dealer’ or ‘download the product brochure’ to guide visitors through the site, and capture their details. Caterpillar make good use of their well established brand, and even have a 'gifts and apparel' online shop which is tailored geographically. They also publish a CAT magazine, available to read interactively on the site, which features company news, product info and user interest stories. This approach would be challenging for less established brands in the manufacturing sector to achieve, however it is important not to underestimate the power and importance of appealing to decision makers on a social level, as B2B buyer behaviours are changing to become more socially orientated. Caterpillar manage a large range of social media accounts for specific brands and their offerings. The CAT brand has many, including construction, marine, forestry and even vocational vehicles. This approach allows CAT to target their communications to specific audiences, rather than dilute the message by talking about too many disparate topics. Another good example of buyer persona research at work here. CAT use several blogs for their main industries: Marine, construction and landscaping, power generation and safety. These blogs are set up in a forum style format and provide useful content targeted at distinct industry buyer persona challenges. The construction and landscaping blog for example includes articles such as ‘three ways to get higher machine productivity’. CAT do use the call-to-action to contact a local CAT dealer at the end of blog posts, but could use offers such as eBooks or buyers guides to convert newer prospects reading the blog into leads. Although these examples are both large companies with significant resources available to help achieve their marketing objectives, it’s well worth mentioning that you don’t need an enormous marketing budget to achieve great results. So long as you’re focusing on your buyer personas, and letting this research shape your online presence and communication approach, digital marketing can help grow your manufacturing sales pipeline in a cost effective and sustainable way.